Why did the chicken cross the road? To get in my belly! I go through phases when it comes to my meat consumption. Some weeks I eat it often and with gusto; Some months I hardly touch it; Some nights I crave a nice bleeding steak; Some afternoons I desire the simplicity of squeezing fresh lemon juice over chicken and garnishing it with some pepper. Instead of feeling like I need to eat X-amount of meat meals a week (or limit myself) I simply listen to what my body needs. This past week my body needed something nourishing– and a tad bit sweet, I admit. I knew exactly what to make: lemon and brown sugar chicken. As someone who has fiddled around (usually unsuccessfully) with brown sugar and garlic chicken—can you say sticky, icky pans?—I enjoy the pre-determined amounts this recipe has to offer. And since it’s baked in the oven I don’t have to open all my windows and brandish a dish towel at a wall of smoke creeping its way toward the smoke alarm. I found that when I first started cooking, I thoroughly enjoyed the allure of sautéing items on the stove and dancing around the kitchen with flourish and ease, bouncing back and forth between four pots and pan. Perhaps this summer I will be drawn back to my multitasking roots. But it is the end of the semester and motivation and energy is running on fumes. Learn to love the timer on the oven. A bonus, oven baked chicken is always juicy and cooked to perfection. Using a meat mallet (or ice cream scoop), pound the chicken breasts thin. Set aside. Combine the flour, paprika and sea salt in a cake or pie pan. Drop each chicken breast in the mixture and toss to coat completely. Heat the oil over medium high heat in a large skillet. Drop each chicken breast in the oil and brown on both sides (should take only about four minutes). 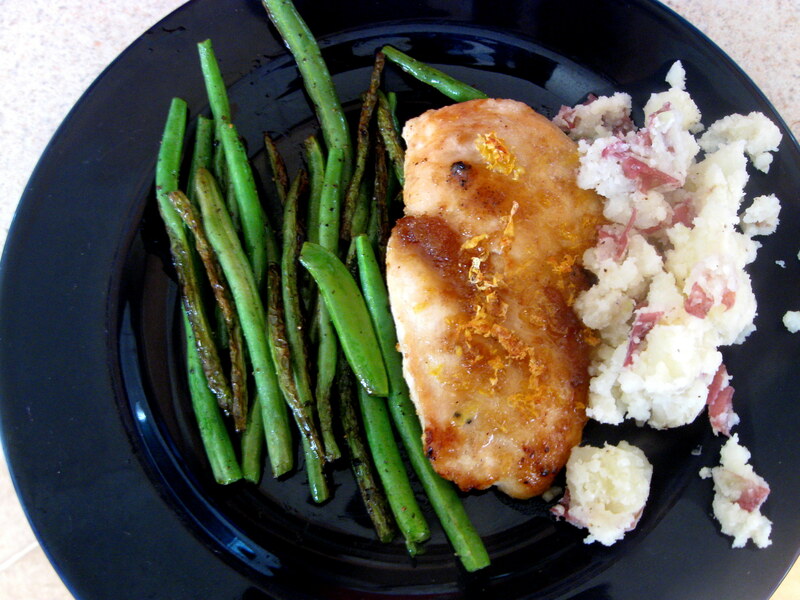 Remove chicken breasts and keep warm on a plate. Pour the lemon juice in the pan and stir to deglaze. Put chicken breasts in a casserole dish and pour juice on top. 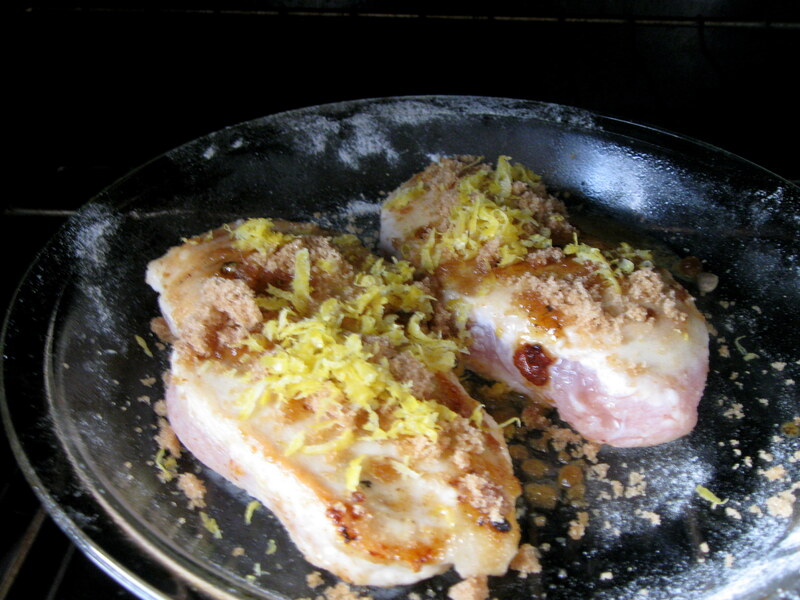 Sprinkle with brown sugar and lemon zest. Don’t get freaked out by this recipe in case you are missing a few items. Feel free to use olive oil or coconut oil in place of canola. If you don’t have any paprika lying around then use chili powder (I had to the other night, and couldn’t tell the difference from the other times I’d made the recipe.) If you don’t have some of these spices, and aren’t entirely jazzed about having to buy a big jar of it, find the cheap spice section in your store. There is a Latin brand called Badia Spices and you can generally find it in the international section. This is a great option if you don’t live by a store with a bulk section. They sell packets of spices for under a dollar. These are great in a pinch if you want to try a recipe but don’t think you’ll need an entire jar of a particular ingredient. Of course, these aren’t the highest quality (source), but they aren’t terrible either. I bought some paprika for 88 cents and was able to use it for three different recipes. Gluten free: If you cannot eat flour, have no fear. Just use an all purpose gluten free flour. Sadly, these mixes are kind of pricey. If the recipe calls for 2 cups of flour use a little less than 1 cup. Honestly, you don’t need to use it all. Waste not, want not. I suppose this trick can be applied to regular flour users as well! Test drive this recipe! Maybe it’ll be something you add to your dinner rotation.